The Artillery in Vancouver has worn a variety of uniforms over the years since the formation of the 15th Brigade, Canadian Field Artillery and the Garrison Artillery that served before them. The following is an accounting of the varied dress that has appeared photographs from the present to the earliest times. The list will not be complete and, as with all things on this website, I'm always looking for new insights, photographs and information. Share them if you've got them. First issues appeared to have the camouflage pattern printed on white material which were prone to rapid fading. Modification 1 - The adoption of CADPAT for all land based operations prompted a request by Air Command to change the design to include concealed buttons to prevent snagging while working on equipment. This style has now become the standard. Modification 2 - CADPAT rank slipons , as shown in the photo, were replaced by hi visibility rank slipons and currently being replaced by Velcro rank slipons. 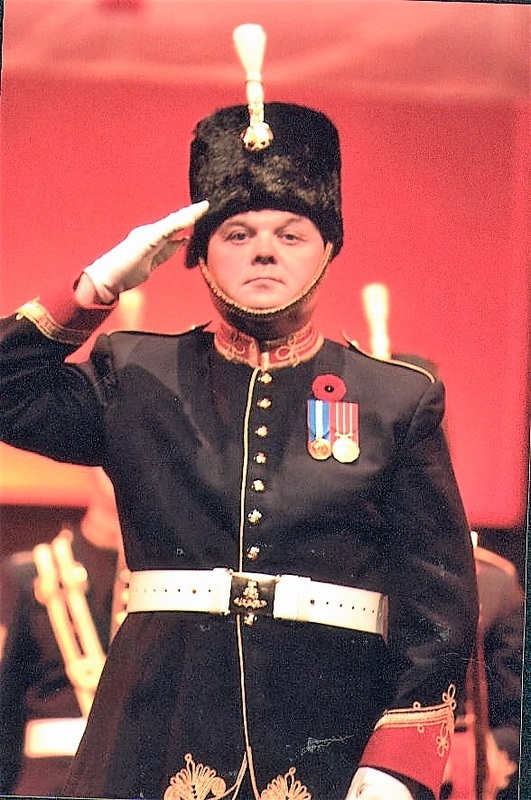 Note - Master Warrant Officer George Dempsey is shown on parade in 2009 as BSM. The 15th Field Artillery Regiment, RCA BSMs carry pace sticks while the RSM carries a drill cane. In 1982 the Canadian Armed Forces introduced DEU throughout the forces with new uniforms for all three environments. Similar in style to the CF Green Service Dress the Army DEU featured a heavier cloth and epaulettes. Metal shoulder titles for corps, branches and regiments were authorised and were worn on epaulettes by all ranks. Rank insignia remained the same as that worn on the CF Greens, and a new series of trades badges were adopted. Berets are worn by all ranks, male and female, depending on local dress instructions. Modification 1 - The Mobile Command badge was replaced by the to the Army single Maple Leaf badge. Modification 2 - The Army re-introduced Division Formation Patches and tradition Canadian Army Officer Ranks. Note - Regimental Sergeant Major Chief Warrant Officer Rob Wishnicki is shown with the RSM's drill cane in this 2009 photograph. The 15th Field Artillery Regiment wears a parade uniform based on the Army universal pattern with the colours reversed as per Artillery tradition with a British Royal blue (midnight blue) tunic with scarlet collar and cuffs embellished with gold lacing, British Royal blue trousers with 1-3/4 in. scarlet trouser stripe. The headdress is a Busby with scarlet bag and white plume. White belt with Artillery Regimental brass. Variants of this dress feature Artillery grenades in lieu of gold lacing on collar and full epaulets in lieu of gold cord on shoulders. Note - Captain Jim Tempest is shown in this photograph. Not seen is the sword traditionally worn by the Director of Music hooked in. The DEU Summer was introduced in 1982 by the Canadian Armed Forces for the Army. Similar in style and weight to the CF Green Service Dress the Army Summer DEU included epaulettes with metal shoulder titles. Rank insignia and trade badges remained the same as that worn on the DEU-winter. Phased out in the late 1990s. Note - Regimental Sergeant Major Chief Warrant Officer Vic Yano is shown on parade in this 1995 photo carrying the RSM's drill cane and wearing the RSM's sword hooked in. The latest Mess Dress (No 2) was authorized on 23 October 1986 and is worn throughout the Artillery. It is based on the Universal Army pattern which consists of a scarlet jacket with shawl collar, midnight blue trousers and midnight blue waistcoat. Regimental detail is based on facings, collars and cuffs in midnight blue and a broad scarlet stripe on the trousers. Unless otherwise stated Male and Female orders are the same. Senior Officers wear crowsfoot sleeve embellishment, Junior Officers and NCM’s do not wear cuff embellishments. Artillery buttons (26 ligne) are used on the epaulettes only. Badges, accoutrements and CF rank insignia of gold wire pattern are worn. NCM’s shall wear gold wire insignia with midnight blue backing. Gold wire grenade collar badges and scarlet backed hazardous skill badges are worn; and Miniature medals/decorations are worn. Trousers, overalls, and skirts are of midnight blue barathea. Overalls have a high english back, The trouser/skirt stripe is 1.5" scarlet barathea. The skirt stripe equally divided along skirt vent; and trousers are optional for females. The shirt will be either a pleated front, turn down collar and French cuffs or a blouse white long sleeved with gold buttoned front closure and high collar. Studs and cufflinks are RCA regimental pattern. Bow Tie is black, 4.75" in length by 1.5" at the squared ends. Black socks, and black shoes if wearing trousers. Wellington boots with spurs if wearing overalls; and plain beige or black nylon stockings and black leather or patent leather pumps with skirt. Modification 1 - The officers' rank has been replaced with traditional Canadian Army Officer Ranks. Note - Lieutenant-Colonel Dan Kuhn in 2006 at the Officers' Mess Annual Saint Barbara's Day Dinner in Mess Dress with optional pocket watch gold chain showing. ​Combats were trialed in the early 1960s and adopted for service in 1963. The new combat uniform was intended to be combined with both existing and new patterns of extreme cold weather clothing to provide Canada's first completely universal all weather field uniform. Developed in conjuction with the 1964 Pattern web equipment, the concept and design of the Combat uniform was based on the premise that the infantry soldier would ride into battle in an Armoured Personel Carrier and dismount to engage the enemy. Combat would require only weapons, ammunition, water and light rations. Additional clothing and personal gear required for living in the field would be carried in the APC. This concept also assumed that the soldier would not be required to march long distances on foot or carry heavy loads. Instead of issuing magazine pouches with the 1964 Pattern web, the breast and waist pockets of the Combat Coat and Shirt-Coat were designed to carry the 20 round magazines for the FN C1 rifle. The breast pockets were slanted and heavily reinforced with nylon liners in order to bear the weight of loaded rifle magazines. The waist cargo pockets were provided with nylon loops for two magazines. The first pattern Combat Coats and Shirt-Coats were designed to carry only four 20 round magazines for a total of 80 rounds of ammunition. Two additional magazine loops were added to the left waist pocket in subsequent versions. Additional ammunition was carried in 60 round plastic (later cloth) bandoliers. Following the introduction of the 1982 Pattern web equipment with it's magazine pouches, the magazine carrying features of the Combat uniform were no longer required and the Shirt-Coat was modified accordingly. When brand new, Combat ranged in colour from O.G. 107 (Olive green #107) which was a grayish green shade, to O.D. 7 (Olive Drab #7) a brownish khaki green colour. Combat was designed to be a low maintenance wash and wear uniform and after a number of washings, uniforms faded to a greenish grey. It was specifically forbidden to dry clean or iron Combat due to it being 50% nylon and having nylon reinforcements. Dry cleaning or the use of bleach when washing Combat resulted in uniforms of startling shades of pink. Three patterns of black hightop Combat Boots were issued during the service life of Combat. Designated Marks I, II and III, they were similar in general pattern but differed in details. American pattern Jungle Boots and tan Desert Boots were also worn on some operational deployments. Dress instructions forbade the use of polish on combat boots, instead a special pattern of black dyed waterproofing compound was issued. Authorised insignia was limited to rank, name tape, national and unit shoulder titles. Rank and unit insignia were reduced in size and were embroidered in a subdued dull green colour. Over Combat's service life there were variations in location and patterns of these insignia but the general concept of minimal insignia remained. A miniature red and white Canadian flag was worn on the left shoulder or sometime both shoulders on operations or postings outside Canada. Although Combat was not initially issued to the Reserves, they were allowed to wear it subject to local or Regimental Dress Instructions. Army surplus stores did a thriving business selling used Combat and 1964 Pattern Web Equipment to Reserve soldiers. It was not until early 1972 that Combat was issued to the Reserves. Note - Major Leon Jensen at Militia Command and Staff Course in 1997 with combat cap. Battle Dress was the primary winter field and service dress uniform of the postwar Canadian Army and was essentially the same as that worn in the Second World War. The wartime pattern lacked lapels and the trousers were fitted with both a map pocket on the left thigh and a field dressing pocket on the right. Battledress was in wear by the Regular army until at least 1970 and was worn by many Reserve units as late as 1974.The first of the new patterns of battledress blouse was introduced in 1947 with lapel and the removal of the field dressing pocket. Note - Lieutenant-Colonel Dumoulin is shown in the war-time battledress possibly in the late 1940s with a beret badge consisting of the Artillery Grenade. This was worn on adoption of the beret by the Army did not take into account the need for a smaller gun badge. Winter field clothing during the late 1940s to early 1970s often consisted of black coveralls or Battle Dress with appropriate cold weather jackets. On one occasion in 1967 the Regiment was issued canvas, wool lined jackets as a temporary measure for the weekend exercise in Shilo Manitoba. Note - Captain Bill Wickett is shown in Shilo, Mb in 1967 wearing the wool-lined jacket. The forage cap was often the preferred choice of headwear for officers during this period. The Bush Uniform was introduced in 1949 as an updated version of the war time Khahi Drill uniform. It consisted of a jacket, long trousers, short trousers, shirt, hat, and brassard. A woman's version of the jacket and trousers was also produced in relatively limited numbers. Made from cotton drill material, Bush was dark olive green (O.D. Number 7). The jacket had an open collar and 4 patch pockets. The jacket could be worn as a shirt, with the sleeves rolled. A separate belt of the same material was supplied. The brassard could accomodate a shoulder title, formation badge and rank insignia. The brassard was worn on both arms or only on the right arm, according to local dress instructions. The Bush uniform was worn as a summer field uniform until the introduction of the combat uniform in the 1960s. It was worn by the Reserves as a field and garrison uniform as late as 1974. Note - Gordie Wright at the Edmonton Airport. Berets alternated with bush caps as headress.